iLoveMountains.org > Take Action > Take Action for Our Water and Our Future! Just yesterday, mountain leaders sat down with members of the Obama administration to demand that the administration follow through on its 2009 promises: to take measures to protect the people, waters and mountains of Appalachia from the dangerous impacts of mountaintop removal coal mining. 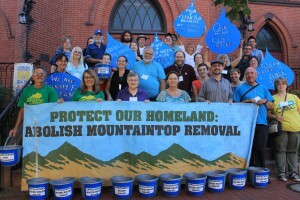 Let the administration know that these mountain leaders are not alone! While we have successfully pressured this administration to take large strides in the last five years–like the thorough review of 86 mountaintop removal permit applications that required individualized scrutiny under the Clean Water Act, and the elimination of an Army Corps permitting practice that rubber-stamped permit approvals–there is much more to be done. In fact, there are four key actions the administration can take this year that will greatly affect the future health of our Appalachian communities and allow the administration to follow through on its promises. Join us today to ensure that the Obama administration takes action!